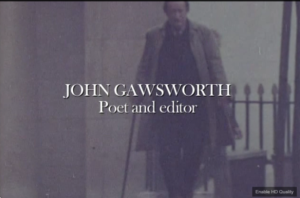 Richard Pine’s Durrell Library website offers a chance to view a 1970 documentary on John Gawsworth which includes footage of Kate O’Brien. In a Fitzrovia pub, Lawrence Durrell and Alan Thomas discuss their mutual friend John Gawsworth (1912-1970), about whom Durrell is about to write his essay “Some Notes on my friend John Gawsworth” (which was published in 1962 and reprinted in Spirit of Place). They are then joined by Gawsworth himself, of whom there is considerable footage in the programme, including a memorable reunion with the novelist Kate O’Brien. This film, made in 1970, is copyright BBC. In a Fitzrovia pub, Lawrence Durrell and Alan Thomas discuss their mutual friend John Gawsworth (1912-1970), about whom Durrell is about to write his essay “Some Notes on my friend John Gawsworth” (which was published in 1962 and reprinted in Spirit of Place). 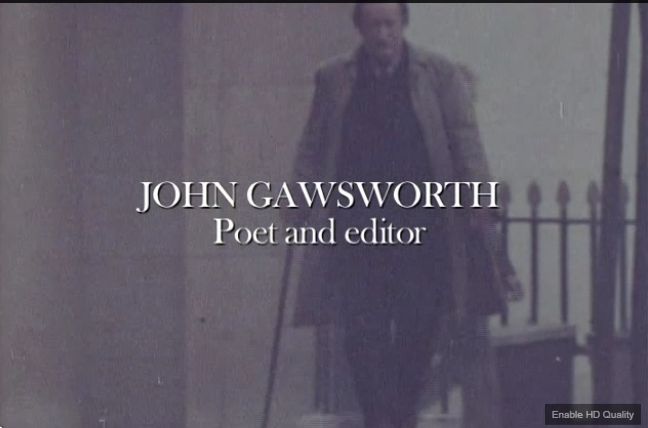 They are then joined by Gawsworth himself, of whom there is considerable footage in the programme, including a memorable reunion with the novelist Kate O’Brien. The programme concludes with Gawsworth’s recitation of his poem “Four A.M. – January 3, 1970 (The Princess Beatrice Hospital)”. It was transmitted on BBC2 television on 9 July 1970, shortly before Gawsworth’s death.